"if it’s strongly enough capital-biased, they [workers] can actually be made worse off"
which is absolutely, unbelievably wrong. where Y is GDP, K is capital, L is labor, and alpha and A are technology parameters. Most economic literature assumes that technological growth comes from increases in A holding alpha constant. This is clearly invalidated by the data, since (as it turns out) alpha is equal to capital's share of aggregate income. So since that share is increasing in the past few decades, alpha must be increasing. 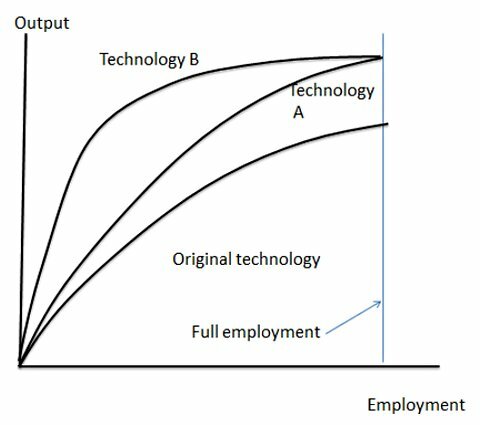 Holding capital and labor supply (as well as the parameter A) constant, an increase in alpha would graphically look like a movement from "technology A" to "technology B" in krugman's graph. BUT! Krugman is wrong in saying that wages fall as a result of an increase in alpha. Yes, he is right that the wage equals the slope of the curve in the graph. But the graph is deceptive--in reality the wage will rise! I can't believe I'm the first economist to point this out. Fred Mosely and Nick Rowe both weighed in and, in my humble opinion, had nothing useful to say. But no one seems to have pointed out that Krugman's problem is that he is assuming that capital is fixed, when in reality we would expect the steady state equilibrium level of capital to rise in response to an increase in capital's share of income (alpha). Maybe that is what Rowe was hinting at here, though if so he's quite cryptic about it. I'm relying on a series of well known results in macroeconomics, so for the non-math readers, here is the result: any capital-biased technological change will cause investors to invest in producing more capital, because the return to capital is now much higher than before (intuitively, they are more willing to give up current consumption to invest in capital now). This means that the capital stock rises to a new equilibrium value. Capital and labor are complements in production, so an increase in the capital stock also increases the returns to labor, causing wages to rise. While it is true that total output rises more than wages do, meaning that workers earn a smaller share of GDP, Krugman is absolutely wrong to suggest that workers are worse off than before--in fact, their incomes do rise, possibly quite substantially. Again, my apologies about the laziness--this equation is not supposed to have an expectations operator, but is supposed to have subscript t on the alpha, A, and K.
For clarification, this in this equation there are not supposed to be subscript t's. K is the steady-state value of capital (meaning the level we would observe if there were no stochastic shocks), and alpha and A are equal to the expected values of those parameters (the realized values being the ones with t in the subscript). So I find myself in an unusual place. Normally when I want to know what I think about something, I read Krugman. But in this case I find myself saying that Krugman is wrong. Even with "capital-biased" technological change, labor incomes still rise. And this allows us to apply results from the Ramsey optimal tax literature that also says Krugman is wrong: in particular, Krugman is incorrect that capital's rising share of income is a good reason to raise taxes on capital to pay for retirement programs like social security and Medicare. The owners of capital don't need their benefits to keep pace with their rising income from capital since they, by definition, make up for that in the fact that they have savings invested in capital to finance their own retirements. And workers' wages still rise by an ample amount in response to capital-biased change, so it is quite possible to finance the government by taxing labor income but not capital. And the mainstream Ramsey literature says that it is optimal (eventually) to cut taxes on capital to zero. There are a few caveats to this result, but these are not part of Krugman's argument so I won't address them here. 1. Paul Krugman could say "sure, but how long will it take to get to your long run steady state?" 2. You have assumed an infinite horizon saving problem, where r is pinned down by Beta in the steady state. You would get a very different results in an OLG model. 3. My "steady state" post wasn't directly related to this question. I was off on another tangent. And my post on Fred Moseley was just making the point that switching from Cobb-Douglas to Leontief production functions doesn't affect the validity of Paul's point. 4. I think there's an empirical problem with Paul's model (just as there is with yours). If there is capital-biased technical change we should expect to see a rise in real interest rates (until r goes back down again eventually in your model's steady state). But we have actually seen falling real interest rates. You would have to consider the time between the adoption of the technology and the time for capital accumulation to adjust. Another consideration unaddressed would be an open system where global wages may rise but depress high wages locally. I don't think anyone believes technology can make us worse off in the end, but it can make many, even most, worse off in the meantime. Yes, it is weird that he says: "capital is fixed". In any case the share of labor falls and inequality between workers and capitalists rises. Will follow up on Nick Rowe's comments. Sounds interesting. I certainly see what you are saying about the interest rate. To a certain extent that was my point: these models don't explain the data. I just wanted to show two things: that the degree to which technology is capital-biased doesn't change the fact that such a change increases wages, and that his model doesn't warrant the policy prescription Krugman advocates--higher capital gains taxes. Its true that I did not plot the transition path to the steady state--for the most part it will simply pass on the stochastic characteristics of the shocks to the parameters in the model. The rapidity of the convergence to the steady state is controlled by the autocorrelation of the stochastic shocks, but the transition path will typically be monotonic, so it doesn't change the conclusions much. To me that means that the point about stagnating wages requires a much more complicated theory than merely capital-biased technological change. In fact, it may not have anything to technological change at all, but instead be due to things like market power. Also, I know that there is a paper floating around out there about the OLG model showing that certain kinds of technological change can actually both increase capital's share of income and suppress wages, making everyone progressively worse off. Eventually I will find time to read it.